A laptop computer is great to have for its mobility and convenience. 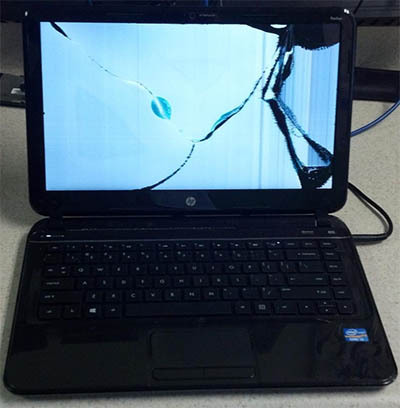 Unfortunately, laptop screens can be easily cracked or broken. Some causes of a cracked screen are obvious: the laptop being dropped or stepped on. But leaving something on the keyboard and closing the lid can also crack a laptop screen. Symptoms of a cracked LCD display are on obvious crack with a black spot and discoloration across the display. Laptop screens can also fail internally. Symptoms of screen failure include low light, colored lines, and discoloration. If you experience any of these issues, don’t worry, screen replacement is a very common repair for a laptop and can be done quickly and affordably. 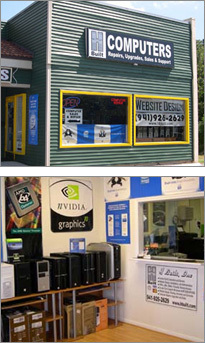 Our trained technicians are qualified to replace screens for every brand of laptop including Apple. Feel free to give us a call for a quote. We fix HP Laptop Screens, Dell Laptop Screens, MacBook Pro Screens, Samsung Screens, Acer LCD Screens, ASUS Notebook Screens, and Toshiba Laptop Screens.